When success becomes synergetic and encompasses more than money, more than status and more than just ‘things,’ life becomes more balanced and harmonious. 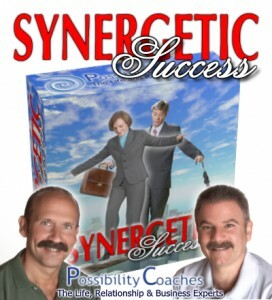 With this as our foundation, Chris and I developed The Synergetic Success Program in 2008 that was taught and continues to be taught in a classroom environment. We are now so excited to be able to offer the rich content and benefits of this program online so anyone, anywhere can experience and apply this information to create true, lasting success in their life. I believe the reason for this was and still is because the most commonly accepted version of success is based on a general consensus handed down from generation to generation. To put it another way: it is likely that no one ever asked us or recommended to us to define success for ourselves. Left to our own devices, we simply followed the pack or threw in the towel. In our world, success is defined solely by monetary gains, status, fame, accolades and medals. So few of us will ever achieve this kind of success for a variety of reasons. First, by the time most of us reach adulthood our sense of self-worth tends to be at low levels because we have been meticulously brainwashed to strive for a level of success that seems unreachable and unattainable. We are told to ‘do and be the best.’ Interestingly enough, has anyone ever defined ‘the best?’ Hint: the best does not exist. Second, it is highly likely we have spent much of our formative years with individuals (namely our family members) who are already disenchanted and tarnished by the so-called inequities and injustices of life. The message here is ‘life ain’t easy, let alone fair.’ From these perspectives, success becomes some far-off destination not likely to ever be reached. The chance of achieving success with this model are slim to none and results in disappointment for most. Years ago Chris and I were fortunate enough to awaken to the possibility that the way to achieving success and the symbols of success were not necessarily success itself. On many occasions, for example, we have coached clients who seem ‘to have it all,’ yet at the deepest emotional and spiritual levels, feel truly unsuccessful. This led us to believe that success, as society defines it, is exclusively about finances and career and at some point sets most people up (Chris and I included) for a less than gratifying or satisfying life experience. With our model of success, we also incorporate other areas of your life where you can be successful such as having good health or a loving relationship. Success has been defined for centuries as a payoff. Know this: success is a process, not a payoff. More so, it is a state of being. Success is emotional! With this realization, Chris and I developed a program that enables anyone to create emotional success for themselves and their life. It’s a new way to define success. We feel so strongly about this program because we have witnessed real transformations of individuals who committed to what we call ‘the process of creating success from the inside-out’. We call it Synergetic Success. The word ‘synergetic’ comes from the word ‘synergy’ which is defined as the ‘sum total of the whole is greater than the sum of its’ parts.’ The sum total we are referring to is the result of applying the process of creating success from the inside-out to 5 key areas of your life: your finances, your career, your relationships, your physical and emotional health and your spiritual connectedness to yourself and the world. The ‘whole’ refers to you…the complete, well-rounded, grounded, balanced You! In our Synergetic Success Guidebook, which contains nearly 100 pages of content, we provide a blueprint for achieving success by illustrating to you how to define success on your own terms. It’s as if success becomes a state of being. Feeling successful becomes your dominant emotion. When you feel this emotion you will truly wonder where it has been hiding all these years. The Synergetic Success Online Program covers a variety of topics such as a guaranteed formula for creating results in any or all areas of your life, discovering or uncovering your life’s purpose, creating positive beliefs, habits and behavior for success, developing a daily method of operation and becoming a role model for success, to name just a few. Achieving success is not intended to be a hard, laborious struggle which requires you to ‘claw your way to the top.’ Success Made Easy is achieved once you have our tools and you give yourself permission to experience it. Our program provides you with the ability to gain clarity, focus, commitment and resolve to create the results you want in your life. It also opens up doors of opportunity time and time again for people who would otherwise walk right past success without even recognizing it while it was staring them right in the face. Chris and I developed this program because we know in our hearts that talent and genius reside within all of us and that includes you. The only missing piece for most people is the tools and applications that will assist them to create success and most significant, to feel successful. I know that success is certain when you are ready and willing to embrace it. Chris and I look forward to being a part of your journey when you decide to use this formula for success in your life.